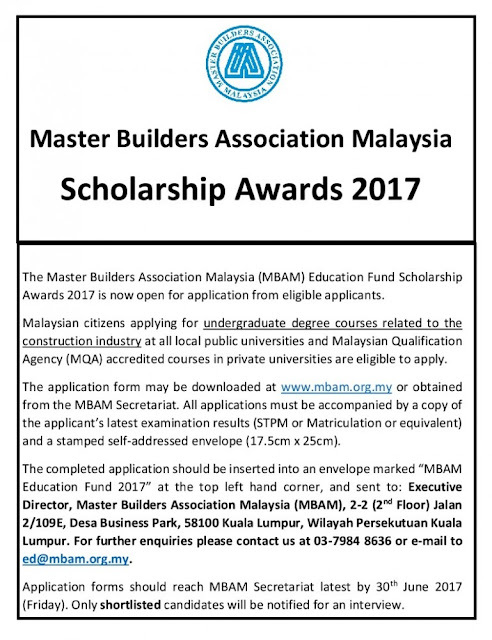 The Master Builders Association Malaysia (MBAM) Education Fund Scholarship Awards 2017 is now open for application for eligible applicants. Malaysian citizens applying for undergraduate degree courses related to the construction industry at all local public universities and Malaysian Qualification Agency (MQA) accredited courses in private universities are eligible to apply. Malaysian citizens below 35 years of age as on 1st January for year of intake for first level tertiary education leading to a bachelor degree or professional qualification in local/ private university. Offer of scholarships will only be made when the Board of Management receives the actual results of examination and original offer letter from local/ private university confirming admission for a course related to the construction industry. Must not be bonded to or in receipt of any financial aid or rewards from other educational institutions or organizations. Be active in sports and extra-curricular activities. Certify photocopies of all required documents must be submitted with application. Applications received after the closing date will be disqualified. Applications must be in sealed envelopes and marked on the TOP LEFT HAND CORNER “MBAM Education Fund 2017”.